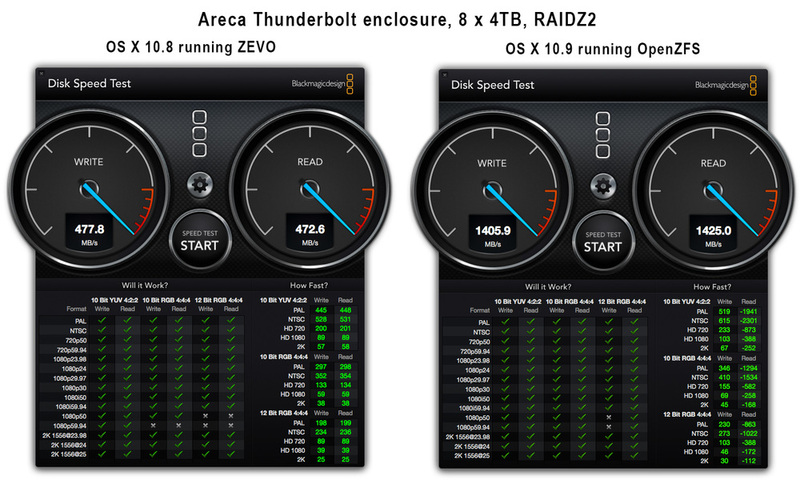 ZFS (OpenZFS) on Mavericks—it works! When ZEVO became unsupported, all of its users became stranded on OS X 10.8, ZEVO's last supported OS version. Most of us have been watching the OpenZFS project with great interest because it promises ZFS support for Mac users on Mavericks (and beyond—they have already announced support for Yosemite!). Before mid-May, I was hesitant to switch to OpenZFS because it is very early software; running a production file system on such early software is not recommended (obviously!). With the release of OpenZFS 1.2.7 on May 15, I decided it was time to give OpenZFS a try. I'm happy to report that the migration went very smoothly—it literally just worked. Not only did my pools import successfully, disk performance appears to be 3x faster—at least, according to Black Magic's disk testing app. Hooray! UPDATE: Disk test is probably bogus: "issues F_NOCACHE calls which only apply to buffer cache (HFS+) but not to ARC (ZFS)"